problems. Issue #703 pickups with a flashback from a few days earlier. Jane's friends are still trying to convince her to get medical attention and to drop the hammer. While basically on her death bed, Mjolnir beckons her, and she knows why, Mangog. Mjolnir still calls for Jane, but Odinson wont allow it. Jane gets out of bed and it seems as if she is going to take up Mjolnir, but pulls back asking for a promise from everyone instead. She tells them they are all soldiers now in the "War of the Realms", and to make sure they don't lose. The last panel shows Jane in her fragile state laying in the hospital bed looking back at the reader. It looks like the end of the line for Lady Jane, though. She has sacrificed all, but the smallest of chances of being cured. Should she transform again she WILL die. Jason Aaron’s writing has been nothing short of epic for this whole series. 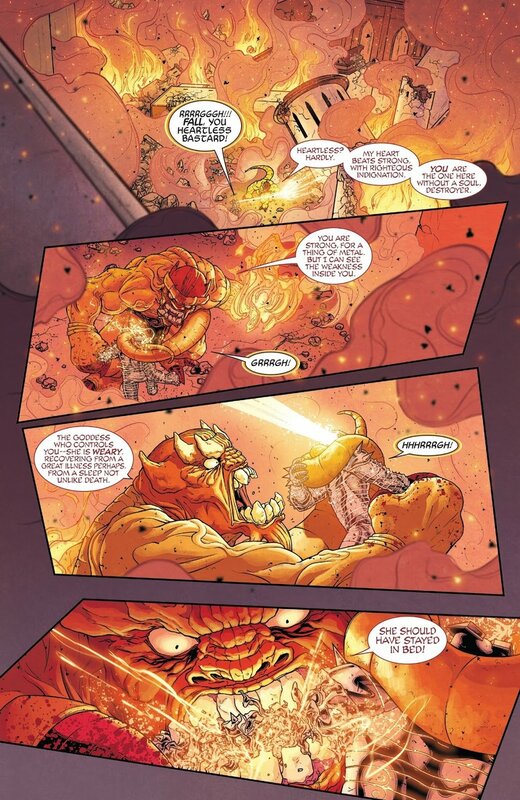 Seeing Mangog wreck Asgard is exciting and sad at the same time, because we all know what comes next.